To celebrate the latest exhibition of photographs by New York-based, Lagos, Nigeria-born artist Iké Udé, Style & Sympathies, philanthropist Jean Shafiroff hosted a private viewing at the Leila Heller Gallery with gallery owner Leila Heller. Following the exclusive tour, Ms. Shafiroff and Ms. Heller hosted a luncheon with the artist Iké Udé at The Americano Restaurant on Thursday, October 24, 2013. Those in attendance included Valerie Steele, Director and Chief Curator of The Museum of FIT, Randi Schatz, President of AVENUE Magazine, Thomas Woodham Smith, Creative Director of Masterpiece London, fashion designer Maggie Norris, Nazy Vassegh, Chief Executive of Masterpiece Art, Design & Antique Fair, Lara Bjork, Director at Art Capital Group, jazz and cabaret singer Cole Rumbough, interior designer Susan Gutfreund and socialite Lucia Hwong Gordon. With a publicly-professed love of all things Wonder Woman, Wendy Williams today appeared in a custom-designed costume on her Halloween-themed talk show as the Amazon Princess. A long-time afficionado of the crime fighter, Wendy regularly drinks from her own Wonder Woman mug during celebrity interviews (a small sample from her personal collection of memorabilia) and has previously had "Wonder Woman" actress Lynda Carter on her couch. "She's strong, she's beautiful, she's feminine and she fights crime!" Wendy said of the DC Comics super heroine. Wendy's celebrity guest, Holly Robinson Peete, also dressed for the occasion, channeling Nicki Minaj. "She's like a hip hop Jessica Rabbit...How does she sit on this booty though?" Costume's ruled The 4th Annual UNICEF Masquerade Ball at Angel Orensanz Foundation in New York City yesterday. Regent Street, London, W1 is thrilled to announce that Leona Lewis, Passenger and Eliza Doolittle will perform at the Regent Street Christmas Lights switch on celebrations on Saturday 9 November. Breakfast presenters Jamie Theakston & Emma Bunton from London's Heart 106.2 will head a star-studded line up leading into the big switch on moment where Regent Street will be lit up by the amazing Christmas lights and a spectacular pyrotechnic display to launch Christmas in London’s West End. This year’s Regent Street Christmas lights will be switched on by Emmy Award® Winning actor Ty Burrell and Hollywood film director Rob Minkoff. The lights depict the forthcoming DreamWorks Animation film Mr. Peabody and Sherman, an all-new comedy adventure for the whole family directed by The Lion King’s Rob Minkoff, which will be released by Twentieth Century Fox in the UK and Ireland on 7 February 2014. BROADWAY'S "THE PREACHER AND THE SHRINK"
Performances of THE PREACHER AND THE SHRINK, a new play by Merle Good starring Dee Hoty, will begin this Saturday, November 2nd at 2 PM at The Beckett Theatre at Theatre Row, 410 West 42nd Street. The official Opening Night is set for Monday, November 18th at 7 PM and the limited engagement is scheduled to run through January 4th. Under the direction of Steven Yuhasz, THE PREACHER AND THE SHRINK also features Tom Galantich (Mamma Mia!, City of Angels, Dirty Rotten Scoundrels), Mat Hostetler (War Horse, “Boardwalk Empire,” “White Collar”), Adria Vitlar (The Columnist, Blood and Gifts), and Nicholas Urda (Love’s Labour’s Lost). Europe's "Live At Sweden Rock"
Europe's "Live At Sweden Rock - 30th Anniversary Show" will be released on 2CD, DVD, Blu-ray, and Digital Formats on November 5, 2013 in North America. Europe took the stage in their home country Sweden for a very special occasion: celebrating 30 years of rock music. The Swedish rock band celebrated this event together with 30,000 people at the famous Sweden Rock Festival. The band performed a total 28 songs, selecting their personal favorite moments spanning from their earlier years up to their most recent songs taken from albums like Last Look At Eden and Bag Of Bones; plus songs they performed for the very first time. On tomorrow’s episode of the nationally syndicated daytime talk show "Katie," Bette Midler stops by to talk about her love for Halloween and legendary costumes. Hear her thoughts on Miley Cyrus and Lady Gaga pushing the envelope and “Hocus Pocus.” Tune-in, to see The Divine Miss M get a big Surprise! In the show, there is a creative competition with “Face Off” contestants and a spooktacular performance by the Broadway cast of “Wicked” in-studio. Plus, Sesame Street’s The Count and Katie “Just Say Boo!” with the kids! 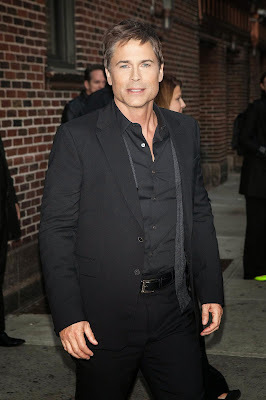 Rob Lowe visited the Late Show With David Letterman yesterday, in New York City. The stars came out for Denise Rich's annual Angel Ball 2013 at Cipriani Wall Street, in New York City. Photos By:: Corredor99 / MediaPunch Inc.
USA Network's "Modern Family", held a Fan Appreciation Day presented by Surface, at the Westwood Village Theatres in Westwood, California the other day. 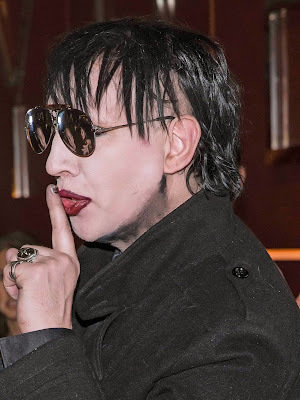 Marilyn Manson hosted at a Halloween bash at HYDE at the famed Bellagio in Las Vegas, Nevada yesterday. Song and dance superstar Paula Abdul arrived in Israel yesterday for her first-ever vacation in the Holy Land. Within 24 hours of her El Al jet touching down from Los Angeles, she had dined in a hip Jerusalem restaurant, hugged shoppers in the capital's Mahane Yehuda Market, toured the Israel Museum and had been received by Shimon Peres, President of Israel, at his official residence. And that was just Day One. INSIDE DEBORAH NORVILLE --- It was like an old-fashioned book release party last night at NYC’s newly-renovated Park Central Hotel on fashionable 7th Avenue, as Deborah Norville’s new tome, The Way We Are: Heroes, Scoundrels, and Oddballs from 25 Years of Inside Edition was officially launched. Norville’s been a broadcasting legend for quite some time; with stints on NBC’s Today Show as well the NBC Nightly News; the weekend CBS Evening News, and was a host and correspondent for two CBS News magazine programs and has been with Inside Edition since 1995. The book, which was exclusively previewed last week on XM’s Brett Winterble Show, wherein Norville said her most desired interview would be with “Dolly Parton … no makeup, no wigs …. just a couple of girls sitting around talking.” It was one of the sat-caster’s best interviews ever and Norville was knowledgeable, funny and, charming. We're big fans. 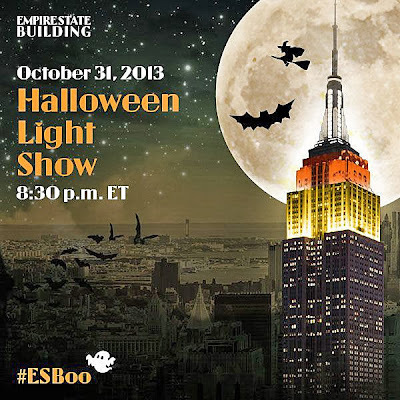 THE SIGHTS:	On Thursday, October 31, 2013, at 8:30 p.m. EST, Empire State Realty Trust, Inc. (NYSE: ESRT) and Clear Channel Media and Entertainment will give New York City a Halloween-themed LED light show choreographed by internationally-acclaimed lighting designer Marc Brickman to a Halloween-inspired soundtrack on Clear Channel’s powerhouse radio stations Z100 (100.3 FM) and KTU (103.5 FM). THE SOUNDS:	Fans in New York and around the Tri-State area can tune into Z100 (100.3 FM) or KTU (103.5 FM) to hear the synchronized soundtrack in real-time during the light show. 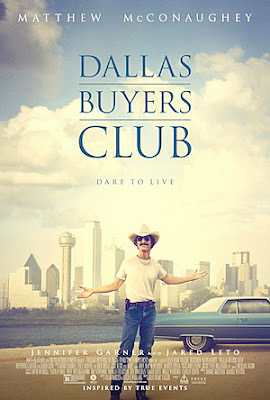 Matthew McConaughey stars in DALLAS BUYERS CLUB as real-life Texas cowboy Ron Woodroof, whose free-wheeling life was overturned in 1985 when he was diagnosed as HIV-positive and given 30 days to live. These were the early days of the AIDS epidemic, and the U.S. was divided over how to combat the virus. Ron, now shunned and ostracized by many of his old friends, and bereft of government-approved effective medicines, decided to take matters in his own hands, tracking down alternative treatments from all over the world by means both legal and illegal. Bypassing the establishment, the entrepreneurial Woodroof joined forces with an unlikely band of renegades and outcasts - who he once would have shunned - and established a hugely successful "buyers' club." Their shared struggle for dignity and acceptance is a uniquely American story of the transformative power of resilience. Josh Lucas and wife Jessica Ciencin, Balthazar Getty, Helena Christensen, Kate Bosworth, and director Michael Polish were among the celebs at the Big Sur Premiere and After-Party where Purity Vodka cocktails were served in NYC last night. Josh Lucas and wife Jessica Ciencin enjoyed Purity Martinis at the after-party at Hotel Chantelle Rooftop. They were the very first people at the venue and stayed for the duration of the party. Kate Bosworth looked stunning in a black floor length dress with a statement neckpiece and her hair pulled back in a braid. Her parents also came out to show her support. Very small and intimate venue, seemed as though everyone were friends and family. Kate and Director Michael Polish were really coupley and cute. They both were very social and made their rounds around the party but would constantly come back to each other. 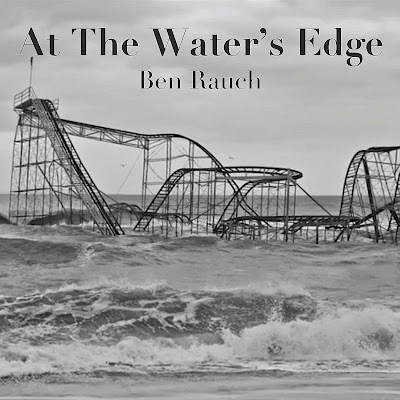 The one year anniversary of Hurricane Sandy is today Oct 29th 2013 and Ben Rauch wrote a song called "At The Water's Edge" along with the amazingly talented Winston Beigel (lyrics), and is donating 100% of the itunes sales raised to the Hurricane Sandy New Jersey Relief Fund! Please help support the song by purchasing it at HERE. 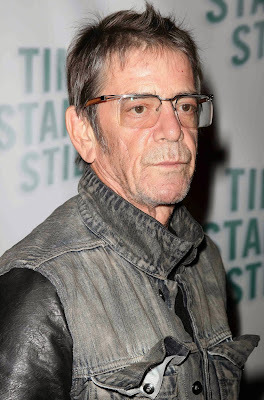 REED RIP --- I was at the desktop yesterday afternoon working, listening to Coldplay, of all things, when the news flashed that Lou Reed had passed … and, it was like a swift kick in the gut. I was never a Velvet Underground man at first and my first introduction to Reed was for his 1972 song “Walk On The Wild Side,” from his Transformer album; I was playing it on my college-radio show. The lyrics to that song literally gobsmacked me when I first heard then …. Was he really talking about that? The song was a Top 20 hit and the accompanying album was solid as well. When I finally looked at the artist himself, I remember vividly reading more and more about The Underground (“Sweet Jane”) … and, then I was hooked. Friday night Kim Kardashian celebrated her 33rd birthday at TAO at The Venetian Las Vegas surrounded by friends, family and fiancé Kanye West. The birthday girl took in West’s concert before heading to TAO for the celebration. Fans, who had gathered hours earlier, surrounded the red carpet to catch a glimpse of Kim, Kanye and the group, which included mom Kris Jenner, sisters Khloe and Kourtney, Scott Disick, Glee’s Naya Rivera, rapper Tyga and his girlfriend Blac Chyna, Jonathan Cheban, Simon Huck and Robin Antin. McDonald’s knows they don’t pay their employees enough to get by. Everyone knows that by now. But, I’ll bet you’d never guess what they said to full time ten year McDonald employee Nancy Salgado, when she called the employee “help line". Nancy said, "You see, my family rations our food each month, my heating bill is skyrocketing now that it’s fall, and I can’t afford to take my kids to the doctor. 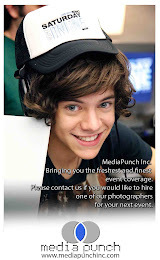 So when I heard about the employee help line, I called." The McResource line was very polite to Nancy, they asked her to hang on so they could get her the Food Stamp and Medicaid numbers in Chicago. This is what Americans pay for. We pay for the low wages these fast food restaurants have, by having to shell out for Food Stamps and Medicaid. Employees like Nancy, who work hard for years with these companies are never paid a living wage. The McResource line also told her to go to the food pantry. 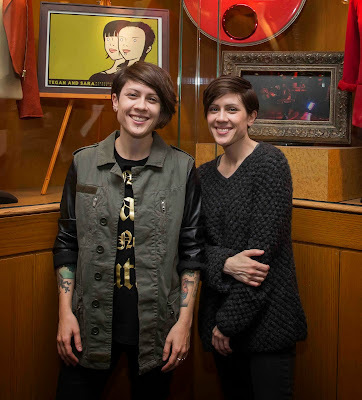 Tegan and Sara were honored with a memorabilia display at the Hard Rock Hotel in Las Vegas, Nevada yesterday. In an effort to bring the rock ‘n’ roll vibe of the Sunset Strip to Las Vegas, longtime restaurant aficionados and owners of Kahunaville at Treasure Island, David Tuttleman and Mark Green, have partnered with Mötley Crüe front man Vince Neil to rebrand their 14,000 square foot Circus Circus venue, Rock ‘n Rita’s. The new venues, VINCE NEIL’s TATUADO EAT-DRINK-PARTY! and VINCE NEIL’s PARTY BUS BAR, which open to the public Saturday, Nov. 9, showcase the combination of Neil’s affinity for tattoos and tequila with Tuttleman and Green’s emphasis on a fun and exciting party-like environment. The mouth-watering menu offers up Neil’s signature Tatuado burgers, burritos and more to tantalize guests’ taste buds. The dining room bar allows guests to pair their meal with a cold beer, lavish cocktail or one of the rocker’s very own premium brands. The New York Women’s Foundation (“NYWF”) held a luncheon hosted by Board Member Jean Shafiroff, at Le Cirque Restaurant,, in support of the 26th Annual New York’s Women Foundation Celebration to be held on November 14th, 2013 at the Starlight Roof at The Waldorf Astoria Hotel.